My latest project is controlling a pedestrian sign with an Arduino, so it will automatically step through the states of walk, flashing don't walk, and solid don't walk. In addition, I added infrared remote control support so I can use a remote control to turn the sign on and off, set it to a particular state, or start the cycle. 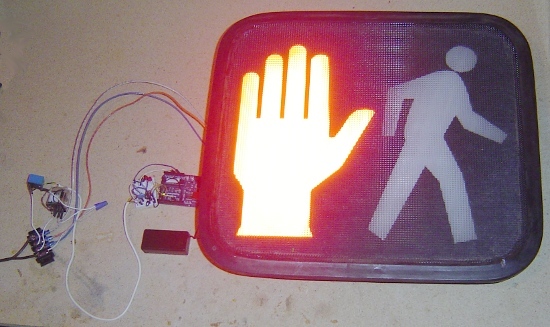 The pedestrian sign is controlled by two relays that switch 120-volt AC on and off; one powers the "walk" part of the sign, and one powers the "don't walk" part. 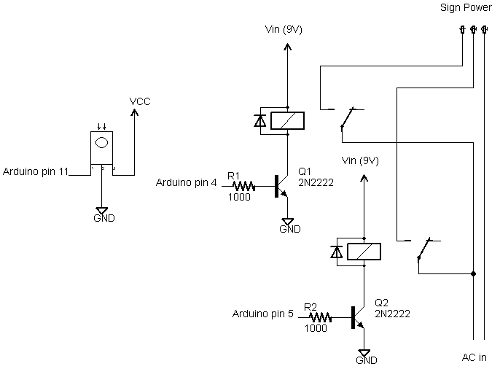 The Arduino drives the relays through transistors connected to 9-volt supply. Technically the relays are 12-volt relays, but they seem to work with 9 volts. I used one 10A relay, and one 5A relay, just because that's what I had around. Needless to say, 120 volts can be dangerous, both to yourself and to your Arduino. Follow the appropriate precautions. I make no claims about the safety of this circuit. 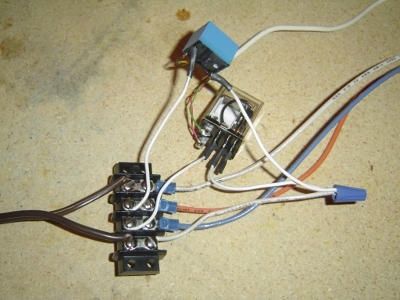 The remote control input uses an IR detector module connected to the Arduino. For details on the IR detection, see the article on my IRremote library. The code section below describes how to modify the code to support different remotes. I found the IR detector didn't work super-reliably when the sign was turned on. This was probably due to high-frequency electrical interference since adding some capacitors helped, but the light itself could have been interfering. I probably should have wired up the relay circuit and the IR detector circuit farther apart to minimize interference, as I did when controlling a DC motor. Inside the signal are two neon tubes, roughly the shape of the hand and the pedestrian; generating red and white light respectively. I use "neon tube" in the generic sense; I don't know what gas is actually inside. 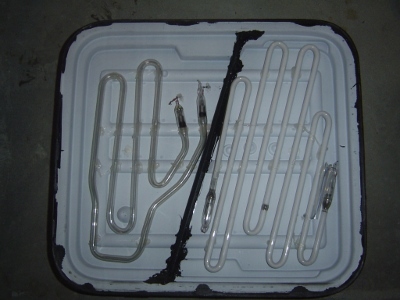 Note that the tubes are not colored and the cover is clear; the red color is entirely from the gas discharge. Beneath the tubes are two high-voltage driver circuits, one for each tube. Each driver circuit runs off 120V AC and has an oscillator (using a LM2903 comparator) driving a flyback transformer through a power transistor (under the board). This generates multi-kilovolts to drive the tubes. 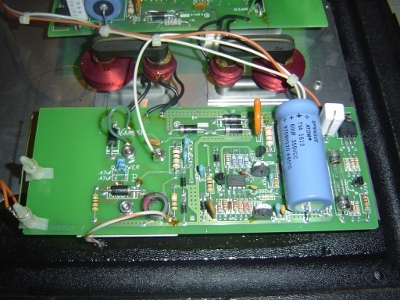 Note at the far left the standoffs that keep the output wire an inch above the circuit board due to the high voltage. Needless to say, I stay away from the circuitry while it is operating. Each driver board has a separate AC input; when AC is fed in, the tube lights up. One drawback of the driver circuitry is it makes a high-pitched whine when turned on. I originally planned to use the sign to indicate unittest pass/fail status, but it was too annoying to people nearby. 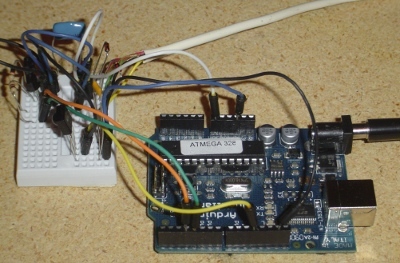 The Arduino code is available at IRtraffic.pde and has two main functions: IR processing and light cycle processing. In the IR code, the IR remote is used to select one of five states: walk illuminated, blinking don't walk, don't walk illuminated, off, or cycling (which goes through the first three states). The IR functionality uses my IRremote library to decode the output from a remote control. The first part of the loop function calls the IR library to see if an IR signal has been decoded. If so, it switches to the appropriate mode. If an unexpected IR value is encountered, it is printed to the serial port. The other main function of the code is timing. There are two timing cycles going on. First, if cycle mode is enabled, the mode is advanced through walk, blink, and don't walk every five seconds. Second, if in the blinking don't walk phase, the output is turned on or off every half second. I originally used delays of 500 or 1000 ms for the timing, but this had the disadvantage that the light wasn't very responsive to the remote control - it would wait up to 1 second before processing the remote control value. I rewrote the code using the BlinkWithoutDelay approach. In this approach, there are no delays in the loop code. Instead, the millis() value is checked to see if it is time to change state. If nothing needs to be done, loop() ends without any delay. In more detail, the boolean cycle is true if the light is to cycle between the three phases. In this case, nextCycleMillis is set to the time at which we move to the next cycle (i.e. 5 seconds in the future). Once we reach that time, the mode is advanced. The boolean blinkOn keeps track of whether the don't walk sign is on or off while blinking. The other independent time is nextBlinkMillis. This is the time at which the don't walk sign should change state, and it is set 500ms into the future. The code may be confusing at first due to the two independent times (nextCycleMillis and nextBlinkMillis) and state variables (mode and blinkOn). It seemed simpler this way rather than folding both cycles into one. I have two extra pedestrian signs; I'll give them away for free if you can pick them up in the SF Bay Area. My IRremote library decodes output from many infrared remotes: Sony, NEC, RC5, and RC6. However, many remotes use other protocols. While it's not too hard to add support for other protocols, I wanted to show how the library can be used with arbitrary remote controls. This post describes a simple routine that will generate a unique code for each key on an arbitrary remote. The demo application flashes the LED the appropriate number of times when I push the 0-9 button on my remote. The IRremote library records the duration of each (modulated) pulse sent by the remote control. Each key on the remote corresponds to a particular code value, which is converted to a particular sequence of pulses. If you know the encoding algorithm, you can determine the code value, and thus the key pressed. However, for many applications it doesn't really matter what the original code value is, as long as you can uniquely distinguish each key. Thus, if you can turn each unique sequence of pulses into a unique value, then this value will indicate the desired key. To do this, I look at the duration of successive pulses. If the pulse is shorter than the previous, I assign 0. If the pulse is the same length, I assign 1. If the pulse is longer, I assign 2. (I compare on-durations with on-durations and off-durations with off-duations.) The result is a sequence of 0's, 1's, and 2's. I hash these values into a 32-bit hash value. With luck, the 32-bit hash value will be unique for each key. Note that these hash values are arbitrary, and don't have any obvious connection with the underlying code value. Most encoding protocols use two different durations, so comparing shorter vs longer will work, but you can imagine a code with multiple duration values that wouldn't work here. In addition, hash collisions could occur, but are pretty unlikely with a 32-bit hash. The code can be downloaded from IRhashcode.pde. The sample application prints the "real" decoded value and the hash value. The "real" value will only work for supported protocols (Sony, RC5, RC6, NEC), but the hash value should work for almost any remote control. The code is pretty straightforward. compare() compares the two measured durations within the 20% tolerance. The actual decoding is fairly simple. results->rawbuf holds the measured durations as space, mark, space, mark, ... The loop compares each duration with the next of the same type, and adds that value to the hash result. The mystery FNV numbers come from the FNV 32-bit hash function, which combines all the values into a single 32-bit value. The following example code prints out the "real" decoded value and the hash decoded value to the serial port. You will want to use this code to figure out what hash value is associated with each key on the remote. Here's a slightly more realistic example. It receives a code from a Philips remote and flashes the LED appropriately. If you press "1", it flashes once, if you press "8" it flashes 8 times, etc. The code simply uses a case statement to match against the pressed key, and blinks that many times. You will need to modify this to work with your remote. If it doesn't recognize the code, it will print it to the serial output. Put these unrecognized values into the code to make it work with your remote. The most likely problem is a key will occasionally have different code values. This is likely due to random errors in measuring the pulses. The code considers any durations within +/- 20% to be equal; you can try increasing this value. If you're using a RC5/RC6 remote, each key will alternate between two different values. In that case, you probably want to use the "real" decoded value, rather than the hashed value, since you can mask out the toggle bit. If your remote uses a protocol with multiple duration values, you probably won't get unique values from this algorithm. For other problems, see the IRremote page, which also has a schematic for wiring up the IR detector. This IR hash algorithm extends the IRremote library to be usable with many more types of infrared remote controls. Please let me know if you use it, and I'll add a link to your project if you want.